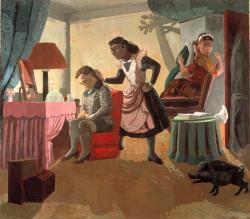 The story at the heart of the painting came to Paula Rego ready-made in the form of Jean Genet’s play The Maids (1947), itself based on the real-life case of the Papin sisters, Christine and Lea, who worked as maids for a rich Parisian family. One day, frightened for no apparent reason other than that of a power cut which inconvenienced and possibly frightened the sisters, they brutally murdered the mother and daughter of the family while the man of the house was out at work. 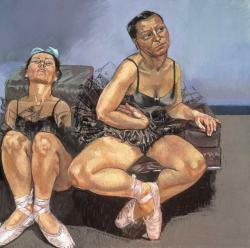 In working with the story, Paula Rego seems to have focused on the unnatural closeness of the sisters, both to each other and the mother and daughter they murder. Ambiguity and menacing psychosis reverberate within the picture, much of it carried in the objects with which the room is claustrophobically furnished. 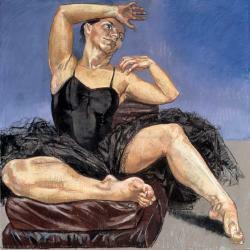 And isn’t there something uncertain about the sexuality of the seated figure? Born in Portugal, Paula Rego’s work always has a sense of magical realism; quirky contemporary mythologies pointing to an underlying psychology and sexuality, through a feminine view point. The Fitting is a scene of fairytale romance turned nightmare. 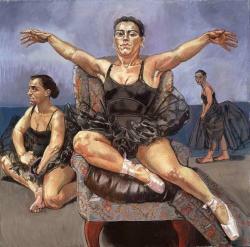 Reminiscent of Velasquez’ Las Meninas, Paula Rego uses loaded imagery and symbolism to create a surreal mystery for the unravelling. In The Family the absent father and husband returns to the picture plane, only to be manhandled by his daughter and his wife. As usual, the narrative clues are ambiguous, and the story could have several endings. Are the women helping the man or hurting him? Who is the little girl at the window? Do the clues perhaps lie in the Portuguese retablo featuring St. Joan, and St George slaying the dragon? Or in the fable of the stork and the fox illustrated beneath? Is the man as doomed as the dragon, or will he in fact resurface like the fox, to eat the stork, once it has removed the bone lodged in his throat? Paula Rego paints a world of dark fairy tale where childhood stories are thin guises for psycho-sexual intrigue and taboo, where magical realism rules, where nothing is certain except the witchy powers of feminism, and the underlying notion that nothing is as it seems. The picture begins with the story of Celestina, a character who appears in Spanish literature in the late fifteen century. 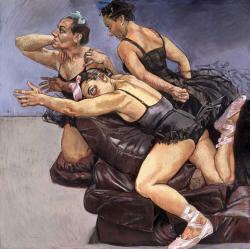 Celestina was a procuress and Paula Rego draws her as she draws all her women – tough, practical, ruthless. 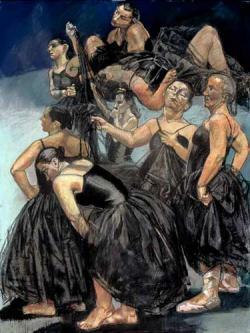 The picture uses the story of Celestina to explore the ages of women, although as Paula Rego wryly comments, if there are seven ages of woman as of man, then her Celestina has already lived through at least thirteen. 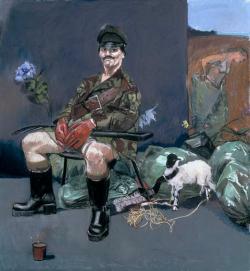 Originally commissioned by the Foundation For Victims of Torture, Paula Rego’s The Interrogator’s Garden offers untold complexities. Here the soldier sits as a camp figure of lust, surrounded by the tools of his horrible trade, each one as mysterious as the symbols in the Arnofini Wedding. 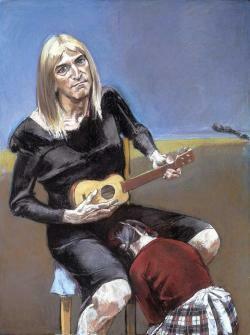 Paula Rego presents a softer side to her interrogator. She draws him as a romantic monster, an object of ridicule ? a symbol of decadence, weakness, and folly. 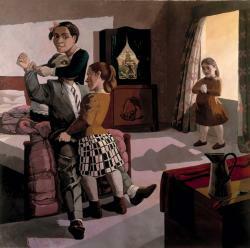 In the late 1980’s Paula Rego made a series of painting to explore close family relationships. All the relationships seem somewhat dysfunctional, particularly those between the fathers and the daughters. 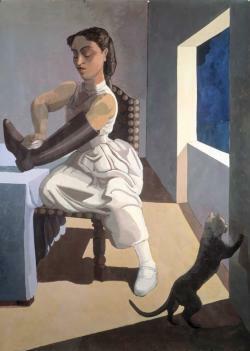 The Policeman’s Daughter is angry, her hand rammed into her father’s boot as she cleans it, a drawing for the painting shows its genesis in a relationship that is a little more innocent – a younger girl, cradling the boot as she cleans it, a toy castle symbolising security at her feet. In the painting, the castle has become a mistrustful cat, and the pose of the girl, taken from a sexually-explicit Robert Mapplethorpe photograph, anything but innocent. 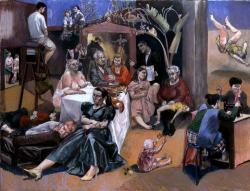 Paula Rego recalls that after the Second World War, German refugees turned up in Estoril in Portugal looking for work. Olga was taken on by a Portugese family to teach her native language to their daughter. They suspected that she had something to hide, but her secret was safe with them. Inspired by a story a friend had written for her, Paula Rego draws her Dog Woman in pastels, referencing the raw physicality of Degas’ drawings. “To be a dog woman is not necessarily to be downtrodden; that has very little to do with it,” She explained, “In these pictures every woman's a dog woman, not downtrodden, but powerful. To be bestial is good. It's physical. Eating, snarling, all activities to do with sensation are positive. To picture a woman as a dog is utterly believable." 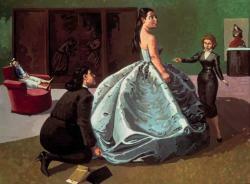 In Swallows The Poison Apple, Paula Rego revises the tale of Snow White to expose the fallible value of youth. Dressed in traditional Disney garb, this Snow White isn’t a beautiful princess, but a middle-aged woman. Pictured moments after eating the poison apple, she lays sprawled amidst overturned furniture, suggesting painful and violent demise. Clutching her skirts, she alludes to her sexual nature, as if clinging to something slipping away. Her body lies between a blanket adorned with spring blossoms, and a sinister backdrop of red and black. Rego illustrates the conflict of reality encroaching on the socially imposed myths of female worth, construing aging as both a physical and psychological violation. 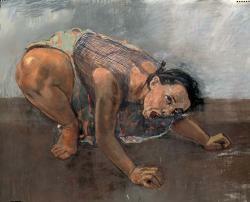 Drawing from her own childhood memories, Paula Rego’s work illustrates corrupted folklore, where fairytale and horror converge to portray feminine experience. Recalling childhood visits to the movies with her father, Rego’s Snow White series appropriates the Disney story with unnerving fictional and autobiographical twists. In Snow White Playing With Her Father’s Trophies, Rego uses the allegory of female vanity to underlie a familial politic. The heroine, pictured in a white dress symbolising virginity and innocence, seems wryly aware of her own sexuality. Sat unladylike with legs spread, she prizes the head of a young buck between her knees, representing sexual awakening and insinuating improper affection towards her father. In the background, her stepmother kneels as aging witch, looking on with scorn and envy. They are Harpies, Homer's personified storm winds who carry the unprepared into oblivion. In the dog women series, which preceded them, there was always a story, a male presence implied though never seen. But with The Ostriches there is no story; no man (or child) is present or implied. The ostrich women may tempt or pursue men, but these are pictures of states of mind rather than narration; the most 'abstract', in the imaginative sense, of her career so far. "I don't think there's much happiness in these pictures," says Lila Nunes, who being Portuguese nevertheless recognises their ferocity. "Some of them would eat you up. They even go out looking. The sleeping one is the safest." Her opinion of a recent article on The Ostriches is indicative: "Not bad, considering the writer wasn't Portuguese." Even the light on the pictures seems Portuguese, a storm light fit for Harpies, though they were drawn in Camden Town and done for 'Spellbound', an exhibition at the Hayward Gallery in spring 1996 to mark the centenary of British cinema. The idea of contributing to the show immediately appealed to Rego, as Disney has been an artistic influence and inspiration ever since she first sat thrilled and terrified through Snow White as a child. For 'Spellbound' she contributed pictures inspired by three of her favourite Disney films - Snow White, Pinocchio and Fantasia. It was Fantasia she concentrated on, the most abstract of Disney's films, his inspiration of famous pieces of classical music through animation. Rego purposely did not look at the film but relied on her memory and an occasional glance at John Cluhane's illustrated history of Fantasia. In the film the ostriches perform the waking or 'Morning' sequence from Dance of the Hours, a ballet in the opera La Gioconda (The Smiling One) by Amilcare Ponchielli, first performed in 1876. Cluhane writes that in the first stages the animators made sketches of ballet dancers who were brought to the studio to perform positions and movements, "the equivalent of a model's holding poses for an artist who draws still pictures". The models were turned into birds, sometimes quite literally. As those present recalled there was "a very tall, very ostrichlike girl, and she loved doing the burlesque of the ostrich for us.We put a few feathers on her costume where ostrich feathers should appear, and a bow on her head, and she performed the routine to perfection." Rego reserves this process, turning the birds back into people. Lila Nunes, who has known the Willing family since she first came to nurse Victor Willing, has modelled for numerous Rego pictures. As she had done for the dog women, Rego drew the finished pictures for The Ostriches direct from Nunes' poses. This made the work especially collaborative, requiring improvisation on both sides. "Lila has been living with my mother's fantasies for so many years that she can now add a little extra to them", says Nicholas Willing, Rego's son - himself an award-winning animator and film director. "Lila and she are very alike in their Portugueseness. It's a question of humour, a certain toughness and blunt lack of sentimentality." Using Nunes for all the ostrich women turns the eight pictures into eight frames of one figure. That is why the series only truly makes sense as one work, one women displaying a range of emotions and positions but so changed in the drawing, only those who know Numes well would recognise it. The sequential order tallies with the film, the ostriches waking up and proceeding to dance. After a hilarious morning selecting clothes at a specialist shop for dancers, where the shopkeeper was puzzled by their total ignorance of dress and shoe sizes, Rego and Nunes returned to the studio. "This chair is always in the middle of the studio and I just sat on it and Paula asked me to put my arms up and she did a drawing," recalls Nunes. From there, in Rego's words, "the work took on a life of its own." Drawing transports Rego back into a childlike frame of mind because, as an only child, it was her chief solace. With The Ostriches she became so engrossed she soon discarded preliminary studies to draw Nunes directly. Awkward positions of neck, arms or legs were supported by cushions, props sometimes included in the picture. Nunes is assimilated rather than portrayed. Sometimes her head is replaced by another; and one or tow different characters creep in, particularly in the backgrounds. The ostrich women are made stockier, emphasising their ludicrous attempts to defy age and gravity, to 'fly'. There is caustic, bucolic, peasant, even black humour in this; that fine line between comedy and tragedy. "Ballet, of course, is an abstraction in the way of movement, of story telling," Cluhane quotes T. Hee, director of the 'Hours' sequence. "Chaplin often said that he walked a tightrope with comedy on one side and tragedy on the other; if he tipped to one side, it would be tragedy; if he tipped to the other side, it would be comedy." Nicholas Willing's first reaction on seeing The Ostriches was to burst out laughing: "I thought they were the funniest things I'd ever seen. I laughed for a very long time and she laughed too - it was surprise and recognition all at once". What he recognised was that world of make believe, so often inspired by films, of the film-fan wanting not just to act Snow White or James Bond, but to be them. The ostrich women are trying - repeatedly, exhaustingly - to be what they never can be. Even when they are together they act in isolation, doing their own thing. Some stalk in the distance, others flop or close their eyes and dream their dreams, waiting their turn. For Rego the figures are grotesque, a word she is careful to distinguish from caricature. Caricature is mockery; grotesque, derived from grotto, describes the dark, secret, vulnerable side of human character. Like a middle-aged aerobics class the ostrich women strive heroically against increasing odds. 'They are old fighters', which is why one falls not like the dying swan in the ballet but the sculpture of the Gallic warrior in Rome: and why others from the heraldic prow of a ship, battling through the waves. Part of their heroism, and of the force of the pictures, is the way they admit to feelings. "The Ostriches are founded in very deep feeling. They are the result of going through a lot of feelings and getting to the essence of them," says Nunes. "I have these feelings but I'm younger and they're mixed up. Paula concentrates many feelings. It's all very connected. Maybe most people don't acknowledge certain feelings, maybe that's why they can become more difficult as they get older. Feelings almost too dark to speak of. I think women accept their feelings more than men. They're more open about them, they talk more about them with each other. A man will say: 'Everything's fine' when it isn't." This may explain why the adverse criticism of Rego's pictures has come exclusively from men. Ideally the two drawings crowded with figures should be hung to make a doorway, a prelude to the rest. They can be interpreted equally as a chorus of ostrich women or one on her own displaying a range of postures and emotions. 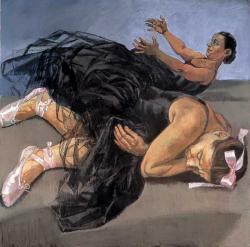 The left-side of the diptych describes spontaneous movement, with each figure using her dress as a prop, like actors improvising. One hides her head in shame, another holds her dress out like a net, several cradle the folds into bouquets or babies, perhaps even a dead baby in one guilty case. In the corner a vulgar duo do not seem to act at all. One leans on her thighs while to her rear the other rudely use her dress as a handkerchief, to hold or blow her nose. In the second drawing the mood is more subdued with even a hint of nemesis or death, the rustling flock becalmed in various attitudes of exhausted anticipation. Is our time up? Asks one, through the wistful inclination of her head. Of course it is! Says a prostrate form. The manly figure on the right stands defiantly, a toreador about to face the bull; in contrast to the gesticulating lady, determined to go down in style, or the figure closet to the light source waiting in the wings, shades of a Degas dancer. There is a particular Iberian quality, duende, a combination of 'soul' and 'fatalism', which has no exact equivalent in English. To say a person has duende is the highest compliment. Can middle-aged women do ballet? Margot Fonteyn did. A person with duende can do anything at any age, so a lady with duende can dance anything any time. I asked Rego if the ostrich women had duende. "They have," she said grudgingly, "now and again". But The Ostriches, that is surely a masterpiece of duende. 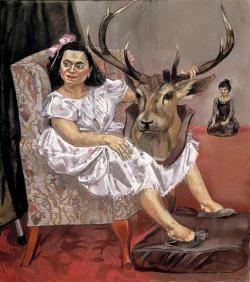 Paula’s Playground: A comprehensive fansite, covering many areas of Paula Rego’s life and her paintings; from collages, ostriches, dog women, to civelli’s garden and gallery tales. Contemporary Review by Joaquina Pires-O'Brien. 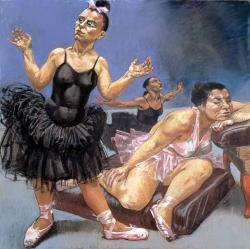 There is something ugly about Paula Rego’s paintings. The clunky, unrefined figures that made her famous in the 80s are undeniably skilful but equally repellent. In the past, Paula Rego has explored fairy tales and delinquent monkeys, but her new obsession is Charlotte Brontë's Jane Eyre and the pent-up passion of its characters. Department of Spanish and Portuguese from the University of Cambridge. A vast selection of images and reproductions. La Insignia. Portugal, abril de 2003. 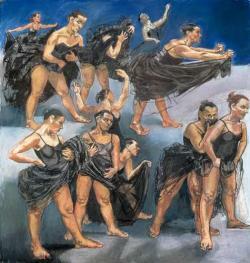 Habitumo-nos a ver a pintura de Paula Rego nas obras de Adlia Lopes, em Agustina Bessa-Lus, da que a sua estranheza tenha sido, de alguma forma, amenizada por incorporar obras de carcter pblico e, mais do que isso, de grande poder meditico.